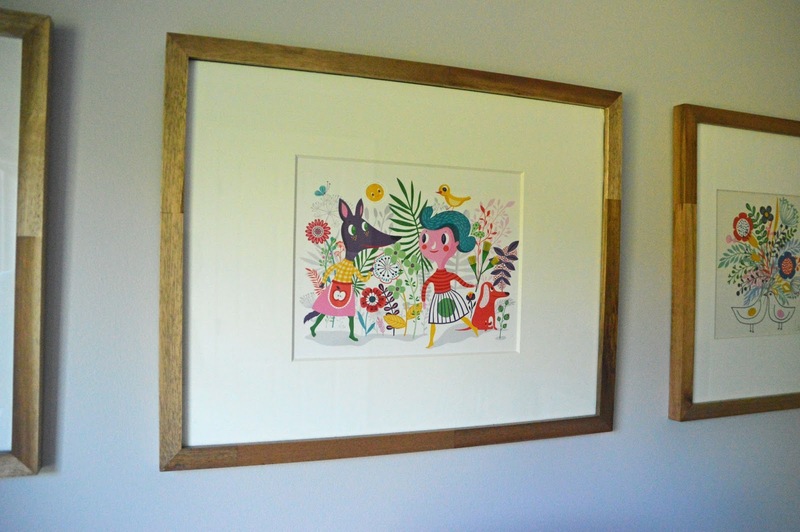 I finally have something in a relative state of completion to report, so I thought I would share with you a quick(ish) and inexpensive way to dress up your child's bedroom wall. 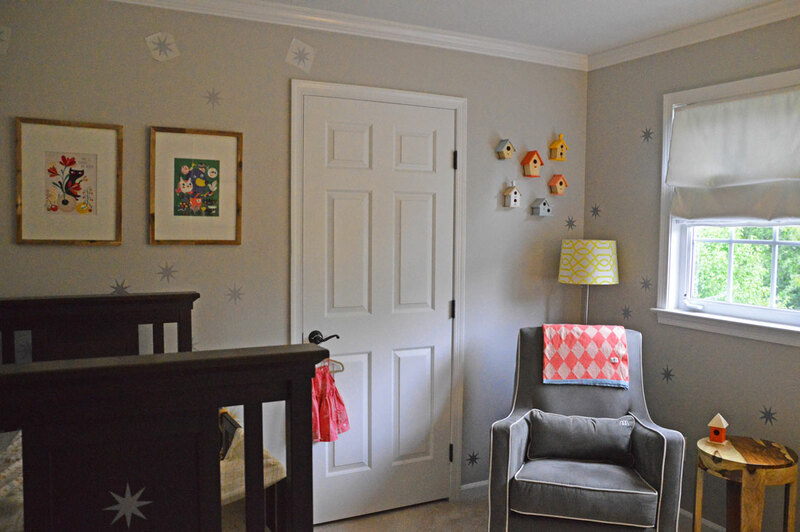 I find myself drawn nearer and nearer to a birdy/ woodland theme in Olivia's nursery but more on that later. 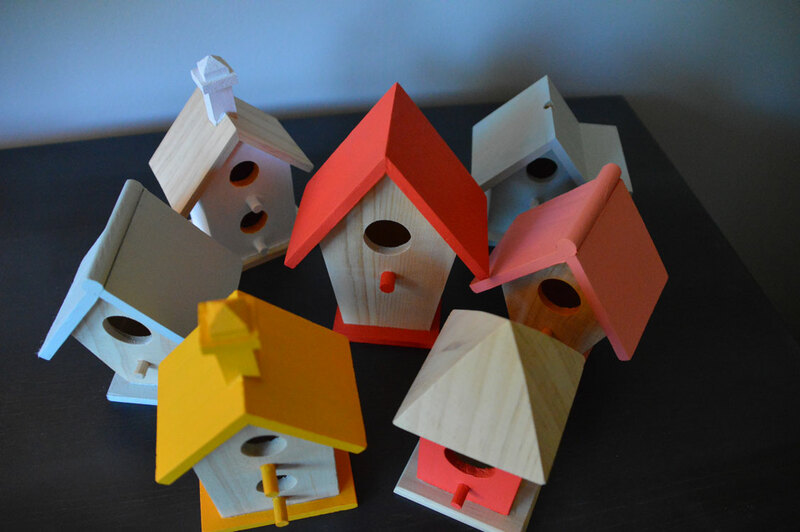 These adorable little basswood birdhouses can be found at Joann Fabrics for the staggering price of $1.09. They come in varying sizes but I got the little ones. I'm convinced that they sell them as a loss leader in order to get you in the door (then you walk out with $30 worth of painting supplies with which to decorate them). 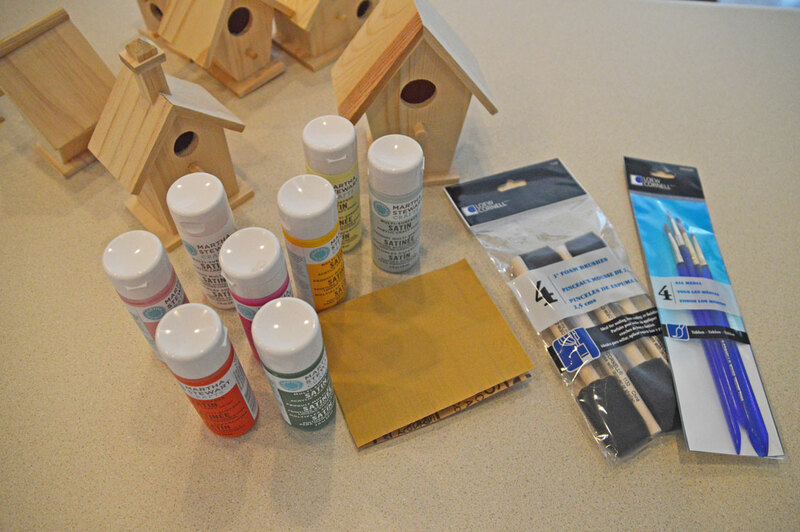 If you'd like to try this easy little crafting project, these are the supplies you'll need: cheapie bird houses, acrylic paints (I used Martha Stewart's Satin Acrylic Craft Paints, $2 per 2 oz bottle), 1" foam brushes and small paintbrush (I used Loews), medium and fine grit sandpaper, painters tape, round handled wooden spoon, small disposable plastic container (or plastic paint palette if you want to get fancy), coloured pencils, blank piece of paper, camera and paper towels. When selecting the birdhouses, try to find ones with a longer roof overhang in the back, as they will be easier to hang on your wall. Only get the ones with a gable end roof (A-line), unless you want to get really crafty with methods of displaying them. Sand the birdhouses down so that they are fairly smooth and there are no rough edges, especially where the walls meet the base and roof, as it will be difficult to paint a straight line otherwise. 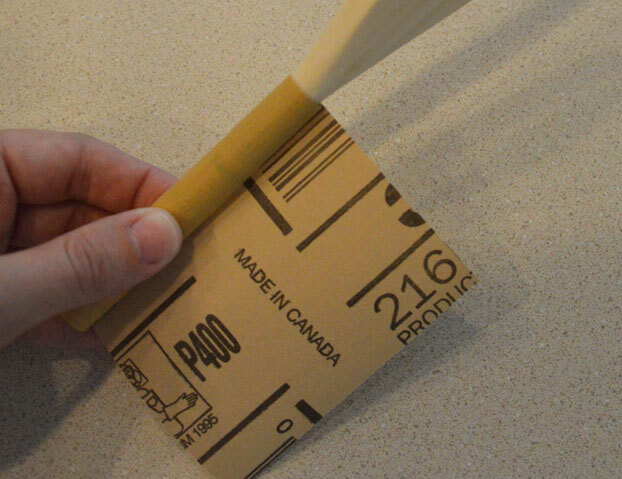 Wrap a piece of sandpaper around the handle of a wooden spoon and attach with a piece of tape, as illustrated below (in case you're the visual type! 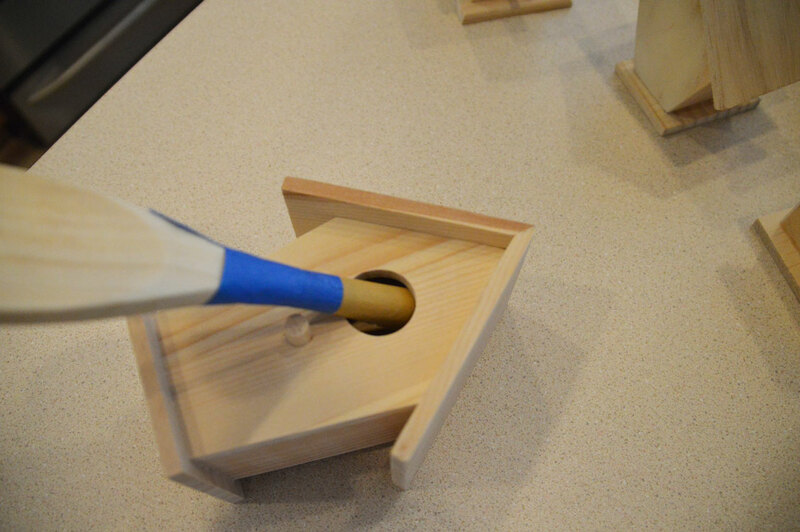 ), then use the handle to sand the inside of the openings. 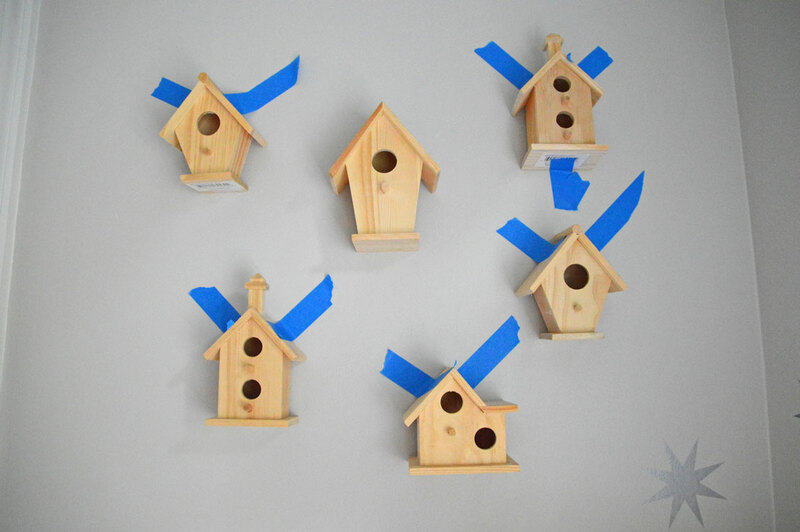 Before you begin painting, you should determine where the birdhouses will be situated on your wall. I used painters tape to stick the houses on the wall because it doesn't leave any residue but you have to press quite hard to prevent them from falling down. Once you have the houses placed to your satisfaction, mark the peak of each roof with a pencil. This is where your nail will go. Before you remove them from the wall, take a picture so that you remember were each one belongs. 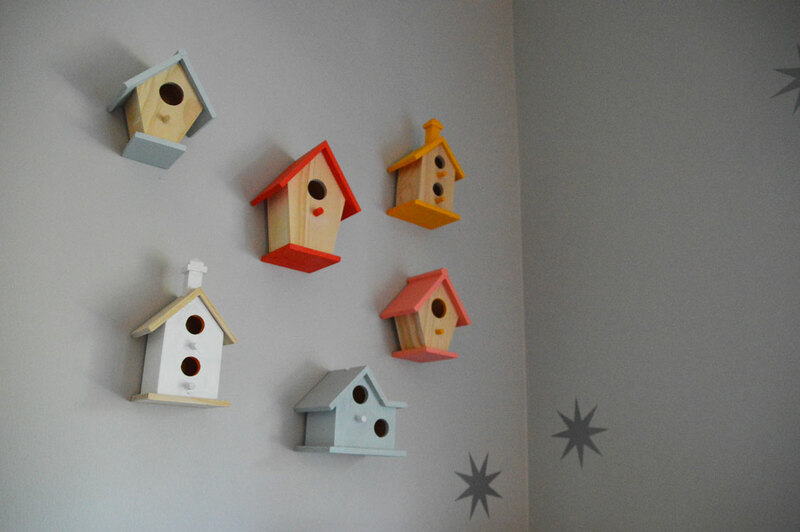 Now that you've determined the placement of your birdhouses, it's time to select colours. I purchased a range of paint colours and then mixed some colours myself as well. I drew colours from the Helen Dardik prints and the pink Ferm Living blanket on the glider. I found it helpful to refer to the camera image and sketch out the birdhouses, so that I could roughly determine which colours should go where. Once you are ready to paint, use the foam brush to lay on the majority of the paint and the paintbrush for the more detailed edges, then use the paintbrush to go over everything you've painted so that the texture is uniform. If you're painting the roof and the base, wait for the roof to dry completely before painting the base. 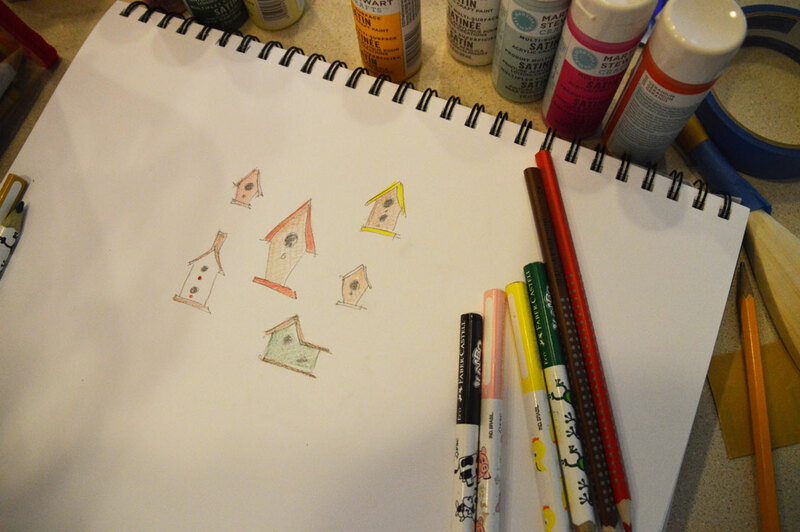 In the mean time, move onto painting another birdhouse. You could also alternate what part of each house you paint, so for another you might paint the walls and leave the roof alone. The lighter colours may need two coats of paint. 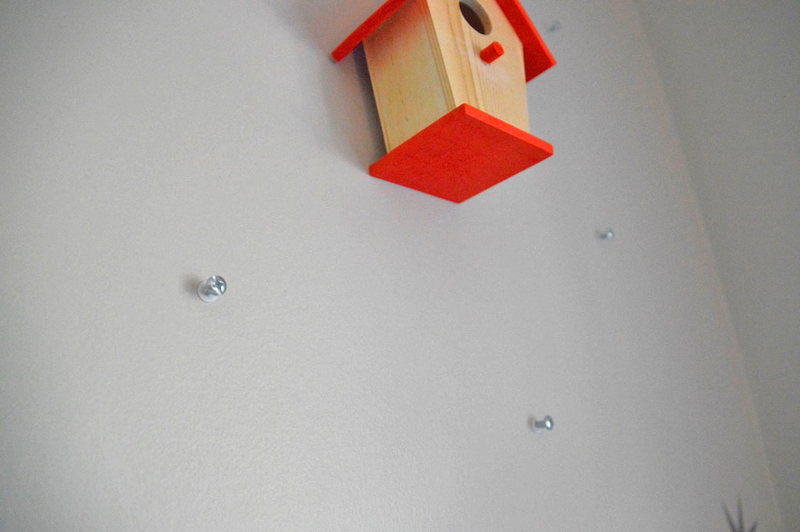 I used drywall screws to affix the houses to the wall. I just hung them over the screw. I suppose I could have used push pins but I didn't want to risk them falling out. I couldn't find the right size drill bit so I didn't even attempt to use the drill for the pilot holes. 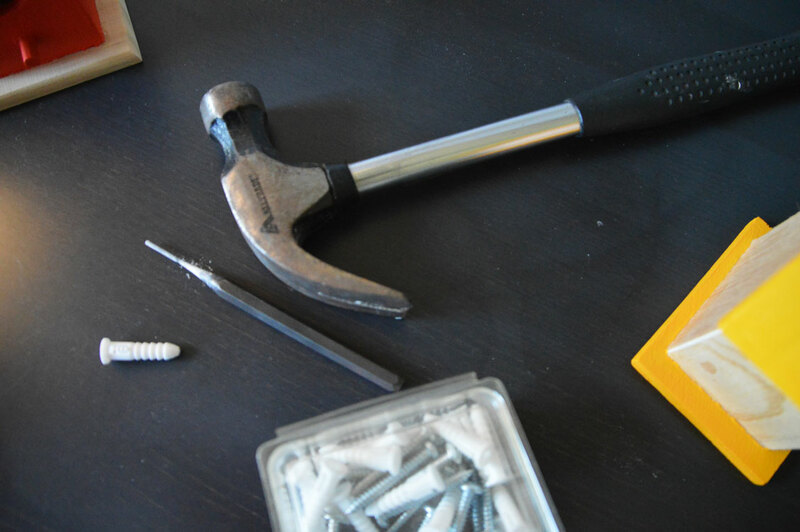 I recommend you use a drill because what followed was definitely an exercise in "how-not-to" attach dry wall screws. See that sharp pick looking thing in the image below (covered in drywall dust)? Well, I found it in my husband's toolbox and pounded it into the wall a few times with a hammer. It did actually work but took 3 or 4 times longer than it should have. 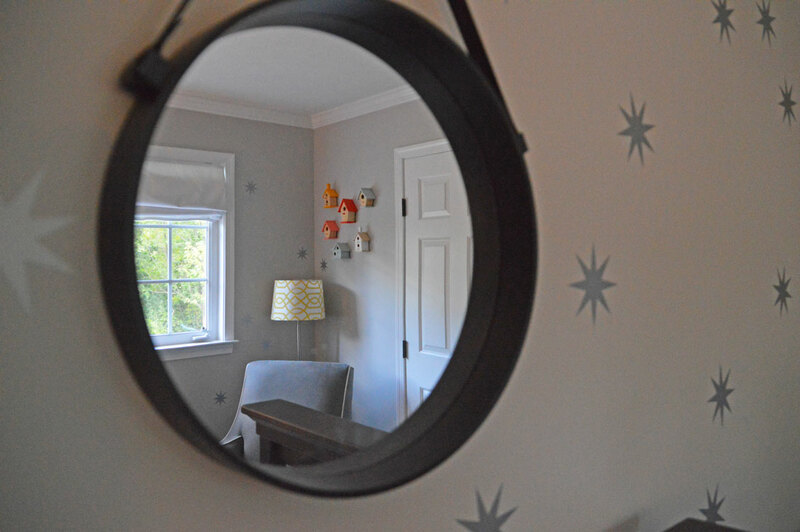 You can probably tell from these images that I've begun the process of adding the silver star decals to the walls. Not even close to finished with that part yet but will post more images once it's finished. There's another project I'm planning on attacking today, and it involves customising the dresser. Wish me luck!